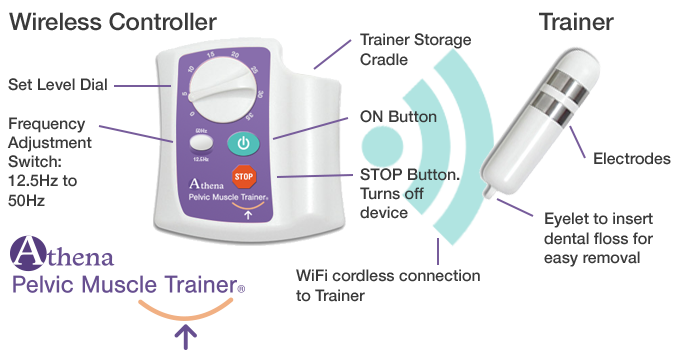 The Athena Pelvic Muscle Trainer™ (PMT) is an FDA Cleared electrical vaginal stimulator that induces the pelvic muscles to contract and relax, similar to Kegel exercises. The system consists of a vaginal trainer with a sealed battery and a wireless controller to adjust the strength of the contractions while the trainer is in use. The trainer is housed in a cradle in the controller. Pelvic floor electrical stimulation (PFES) is a simple, low-risk treatment for incontinence resulting from weak pelvic floor muscles or a hyperactive bladder. An electrical current activates sensory nerve fibers that can facilitate or inhibit a sensory-motor response. The Athena PMT has no side-effects, especially important for patients who may be on other medications or have other medical problems. It is a non-invasive first treatment alternative for women’s incontinence. If the patient requires medication or surgery it will help assure success by providing a stronger pelvic floor muscle. The Athena PMT is designed to be used easily and safely in a patients home. This ease and convenience helps patient compliance with pelvic floor muscle rehabilitation. Patients will continue to have a device that will help them maintain their pelvic strength, even after treatment is completed. The Athena Pelvic Muscle Trainer is intended to provide electrical stimulation and neuromuscular reeducation for the purpose of rehabilitation of weak pelvic floor muscles for the treatment of stress, urge, and mixed urinary incontinence in women. You have a neurological deficiency that does not permit proper sensory perception or stimulation. You are currently pregnant or attempting to get pregnant. You have a cardiac pacemaker or a history of rate or conductive disturbance. You have anatomical vaginal structures that do not permit proper and complete placement of the trainer. You have irregular menstrual bleeding cycles. You have urinary or vaginal infections, localized lesions, or other undiagnosed symptoms. >You have a history or symptoms of urinary retention. ...their opinion is that PFES may be efficacious for both stress and urge incontinence in women in whom traditional treatment approaches have failed.....ACOG supports the availability of PFES devices for patients because they are convenient, have no side effects..."
"APTA cites several studies which demonstrate that electrical stimulation can significantly reduce UI, and they strongly support its use, particularly in patients who are not capable of voluntary muscle contractions. The APTA feels that PFES is a valuable treatment that improves efficiency of incontinent care along with pelvic floor muscle strengthening and behavioral techniques. Copyright © 2016 Athena Feminine Technologies, Inc. All rights reserved.